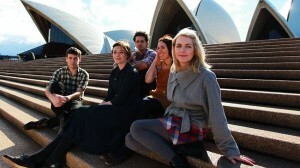 Following the success of the 2005 album, She Will Have Her Way, which showcased a parade of female Australian vocalists singing tributes to the work of Neil and Tim Finn, and then the 2010 album He Will Have His Way (I’ll leave that one up to you to figure out), seven Australian artists have jumped into a tour bus to present They Will Have Their Way. This nation-wide tour has been winding its way around Australia for the past few weeks and features the talents of Sarah Blasko, Clare Bowditch, Sally Seltmann, Holly Throsby, Paul Dempsey (Something for Kate), Alex Gow (Oh Mercy!) and Lior. On Friday, the tour landed in Adelaide at Thebarton Theatre. Sadly, the night did not start with a bang, but with a slightly a odd synthesised beat and some clunky, intrusive piano chords smothering the Crowded House classic, ‘Four Seasons in One Day‘. Sitting alone at an electric piano, to the side of the dark stage, Sally Seltmann certainly looked dramatic enough to be the opening act, however her arrangement fell short and her voice had trouble carrying over the too-heavy electric keyboard. Hopeful for better things to come, the audience welcomed Lior to the stage. After welcoming those present he started with ‘Into Temptation’. The song started in an altered fashion with big, soulful vocals and a full on sound. Lior then grabbed his acoustic guitar and the song took on a form more like the original (at which point the crowd cheered heavily!). It seemed that this would have been the better choice as the opener. Next up Clare Bowditch joined Lior on stage to deliver ‘Won’t Give In’, in duet form. The two singers voices fit incredibly well together, a great pair! This was followed by the biggest faux-pas of the night, with the four ladies performing ‘Fall At Your Feet‘. There’s no doubt that Clare (who took the solo) or any of the other musicians could have performed this song well if they were doing it their own way. However in this arrangement the vocals were just too big, turning this sweet ballad into something of a cheesy pop song worthy of Eurovision. The harmonies were odd, and obtrusive and I’m sorry to be the one to say it, but the four voices just did not fit together well. Happily, the entrance of Paul Dempsey brought with it some fresh energy. His first tribute to the Neil-penned ‘Message to my Girl’ was a crowd favourite. Dempsey’s on stage presence and dynamic style brought another element to this much loved classic. He was definitely one of the stand out performers of the night. Most of the biggest songs were saved for the second half of the set. In general the music after the interval was darker and heavier. Sarah Blasko’s slowed down, bass heavy tribute to ‘Don’t Dream It’s Over’ which finished with all hands on deck was one of the highlights of the set. Paul Dempsey’s performance of ‘Chocolate Cake’ was an unexpected choice, however it was nice to hear a departure from the greatest-hits dominated set. The three boys banded together to perform the Split Enz hit, ‘I See Red’. This song, performed pretty much like the original, was the first song that got the audience out their chairs and dancing en-masse. Complete with Dempsey’s athletic moves (jumping on and off the stage and running into the crowd), was a great choice for an end to the (pre-encore) set. After a brief departure, all seven singers re-entered (with some holding palm fronds) to finish the night off with ‘It’s Only Natural’, and finally ‘Weather With You’. Apart from being a great night of tributes to two musical giants whose songs have been a part of so many people’s lives, the really nice thing about this concert was the enjoyment all the performers appeared to be getting out of singing their hand-picked selection of Finn brothers’ songs. This entry was posted in Music and tagged alex gow, clare bowditch, crowded house, he will have his way, holly throsby, lior, neil finn, paul dempsey, sally seltmann, sarah blasko, she will have her way, split enz, thebarton theatre, they will have their way, tim finn. Bookmark the permalink.